Clothing must be hung on wire or heavy duty plastic hangers. We recommend wire hangers as plastic ones break and items end up on the floor. Infant hangers only work well for Newborn to size 2. Sizes 3 and up tend to fall off infant hangers, causing your items to fall to the floor during the sale. Use larger hangers for sizes 3 and up. The hanger hook should face the left like a question mark with the tag pinned to the right side of the garment as you face it. See illustration above. Only 3x5 index cards vertically. Use BLUE or BLACK ink if you DO NOT wish for the item to be sold at 1/2 price on Saturday. Write the entire card in RED ink if you DO wish for the item to be sold at 1/2 price during the 1/2 price sale on Saturday. We strongly encourage you to write your tags in red. If an item is still available on Saturday, the possibility of it selling increases significantly if the card is written in red for the ½ price sale. It is also HIGHLY encouraged that items priced for $5 or less be written in RED. Strikeouts and highlights will not be accepted. The whole card must be written in red. Draw a horizontal line 1/3 of the way down the index card. 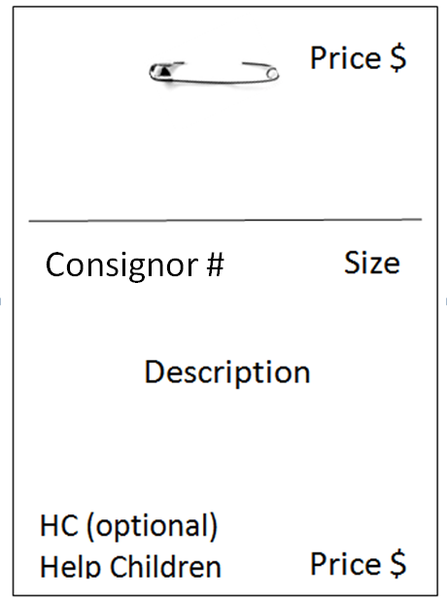 Place your Consignor # on the left just under the line that is 1/3 of the way down. Make sure it is the right Consignor #. Place the size of the clothing on the right just under the line that is 1/3 of the way down. Be specific such as 6 – 9 mo. Not S,M, or L.
In the center of card, give a short description of the item on the tag in case the tag and item become separated. Example: "Girls Talbot Kids Red Plaid Shirt" instead of "red shirt." Optional - Place HC (for Help Children) at the bottom left corner of the card ONLY if you wish your unsold item to be donated to charity following the sale. Place the price at the bottom right corner of the card. You set the price on all items, so price to sell. Use $1.00 increments (not .50 or .99). Write neatly! See our Pricing Guide for more information. Attach your tags using a HORIZONTAL safety pin to the upper right front of the garment as you are facing it. Please pin the TAG to the item with a 1 inch safety pin. No straight pins! DO NOT double tag your items. Doing so causes confusion and could result in your item not being sold. DO NOT use any other size of card than a 3x5. Smaller tags get lost in the shuffle as the cashier rings up customers resulting in you not getting credit for your sell. Sets -- Clothing tends to sell best as an outfit or set. Pin the waist of the pants, shorts, or skirt to the back of the shirt with a large safety pin going through the top of the hanger. Pants/Skirts/Jeans - Pin the waistband of the pants or skirt to the shoulders of the hangers. Use Wire Hangers only! Use big safety pins! Do NOT fold pants over the hangers. Shoes -- must be in perfect condition. They must be clean, have shoelaces, etc. The card must be attached to the shoes and NOT inside a shoebox. Tie shoes together with a ribbon or a zip tie. If you put shoes in a Ziploc bag, pin the tag to the outside of the bag. LIMIT: 5 pair of girls shoes and 5 pair of boys shoes per consignor. SHOES MUST BE WRITTEN IN RED TO SELL ½ PRICE ON SATURDAY. Toys, Furniture, and Equipment -- Must be clean, have all the parts, and be in working order. If batteries are required, please include them with the item. Use Ziploc bags for items with lots of parts. Tape the bags shut with clear packing tap. Place the tag on the outside. Do NOT put the tag inside the bag. We cannot get the tag out when the shopper is purchasing the item. SMALL TOYS MUST BE WRITTEN IN RED TO SELL ½ PRICE ON SATURDAY. Small toys, books, puzzles, movies, DVDs, electronic games, board games and shoes must be written in red, so they will sell for ½ price on Saturday. Loose Articles – Individual items in which a 1 inch or larger safety pin can be attached (such as a bib, a burp cloth, a large bow, a tie, etc.) can be tagged separately so we can sell them in item specific tubs for customers to sort through. Sets or groups of puzzles, bows, bibs, bottles, cloth diapers, small toys, socks, etc. must be in a clear plastic bag with the tag taped with clear packing tape to the outside of the bag. Please also seal the top of bag with clear packing tape. Hard to Tag Items -- Punch a hole or cut a slit in the index card and tie with yarn or ribbon. (To secure the hole or slit, you can place clear packing tape over the top of the index card before punching the hole or cutting the slit. This keeps the card from ripping.) Tie yarn or ribbon with the tag to the item. If tying is not an option, you can use clear packing tape to tape the ribbon to the item. Be careful that the tape will not tear off any part of the item you are trying to sell.